The complexities of employee empowerment have been largely underestimated and it is clear that organisations struggle with putting the concept into practice. Rozana Ahmad Huq recognises that effective utilisation of human resources is a strategic issue for organisations. Hierarchical organisations struggle to survive. The growing trend for downsizing and merging of organisations means that they can no longer maintain the 'command and control' approach and employees are given more responsibility and expected to take decisions. However, simply burdening employees with extra responsibility without empowering them does not deliver results. Drawing on her own research in organisations, Dr Huq investigates the concept of empowerment in a new way that combines themes from the disciplines of management and social work, the latter being a domain where empowerment is an important construct. This helps to bridge the gaps in knowledge in the management domain and draws attention to the positive and negative psychological implications for employees of the practice of empowerment that are often ignored by leaders and managers. Ultimately, the author offers a 'practice model' to help people in management and non-management understand the new roles and behaviours that they need to adopt if empowerment is to become a reality. This book is a resource for any business or other organisation genuinely interested in employee empowerment and for those with a responsibility for teaching about it. A long-standing theme of my work in relation to leadership and management has been the importance of getting the best out of employees (supporting them, developing them, taking workplace well-being seriously), rather than making the mistake of trying to get the most out of them (piling on the pressure, seeking to maximise exploitation, regarding them as expendable). I therefore welcome this important book on employee empowerment. Underpinning employee empowerment is the well-supported idea that giving employees a degree of autonomy and trusting them to make decisions within their sphere of responsibility will produce better results in both quantitative and qualitative ways, and give rise to better consequences for the organisation and the individual alike. Based on a research project, this book offers an intriguing and well-researched perspective on the subject matter. 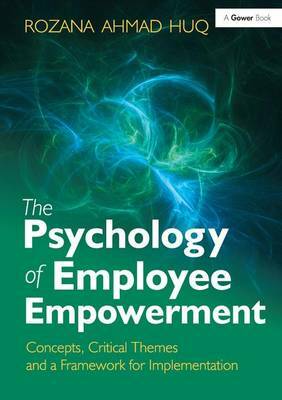 Recognising the relative paucity of material on employee empowerment in the management literature, the author has extended her analysis to include literature from the field of social work where empowerment has received far more attention, particularly in relation to client empowerment. Indeed, empowerment has long been recognised as a central feature of social work practice (Thompson, 2007). The author takes three themes around empowerment from the management literature and four from the social work literature to provide a fuller framework of making sense of employee empowerment. This creates a broad-ranging model that could serve well as a basis for analysing and informing efforts to promote employee empowerment. The focus is on businesses and competitive advantage, but the insights offered here could equally be applied to public service and voluntary sector organisations. Indeed, employee empowerment could be seen as a useful way forward for any organisations, as what it seeks to do is to help make working life meaningful, and therefore something that they can readily engage with. There is an irony that so many organisations invest significant sums of money in employing staff and then develop regimes and cultures that so often seem to be geared more towards restricting human potential, energy, creativity and commitment than to capitalising on what their employees have to offer by creating the right conditions for them to flourish, take ownership and produce the best results they can. It is as if they are treating their human resources just like any other resources, without appreciating what a huge difference being human makes (Thompson, 2013). This clear, intelligent, well-written book therefore offers an important foundation of understanding that should be very useful to any manager or management team or human resource professional who is committed to making a reality of employee empowerment. It should also be of value to trade unionists who want to play a part in supporting their members in taking forward employee empowerment initiatives as effectively as possible. It will also be of use in social work as well as in the broader field of people management. That is because, while, at the practitioner level, there is a strong emphasis on empowerment, at the organisational level, the idea of employee empowerment is lost in the anxiety generated by target-based systems of management and risk-averse cultures that tend to be so restrictive and stifling, far removed from the important ethos of employee empowerment. Thompson, N. (2007) Power and Empowerment, Lyme Regis, Russell House Publishing. Thompson, N. (2013) People Management, Basingstoke, Palgrave Macmillan.